Healthy No Bake Chocolate Peanut butter chewy bars using just one bowl, 5 ingredients and less than 2 minutes! 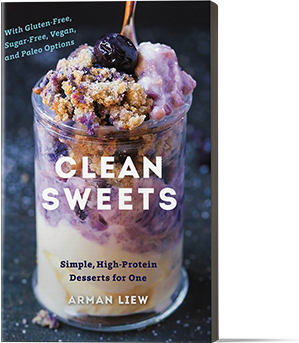 This quick and easy snack or dessert is naturally gluten free, vegan, dairy free and can be made sugar free! I’m a huge advocate of catering to those who love different textures. Last week we had healthy no bake chocolate peanut butter CRUNCH bars and this week, we have their chewier version! Initially, I thought by switching out the crispy rice cereal for rolled oats, it would be too similar to a granola bar. 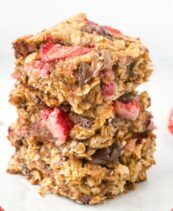 I’ve shared a chewy granola bar recipe here before, along with a simple 3 ingredient oatmeal bar recipe. What I HAVEN’T shared is one which focuses on the chocolate aspect, rather than the oatmeal side. Are you a fan of super chewy bars or chewy bars? Before you roll your eyes and claim them to be the same thing, check out the granola bar aisle at your local supermarket. The other day, I was looking at some of the packaging and the variety of the same flavor was a little obnoxious. You could choose from a standard chocolate chip granola bar, chewy chocolate chip granola bar or extra chewy chocolate chip granola bar. One brand even had a crunchy chocolate chip granola bar, but those are probably for those wanting their tooth removed. 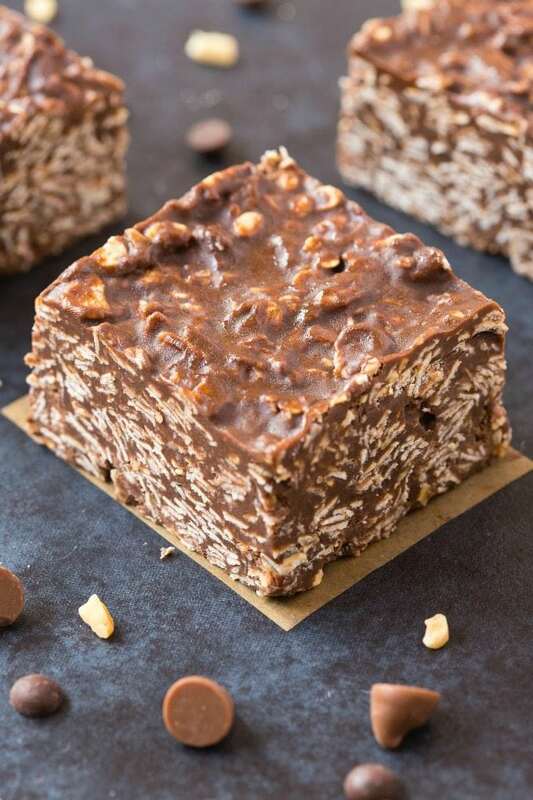 Fortunately for you, these healthy no bake chocolate peanut butter chewy bars are the perfect balance between super chewy, chewy and hands down deliciousness. 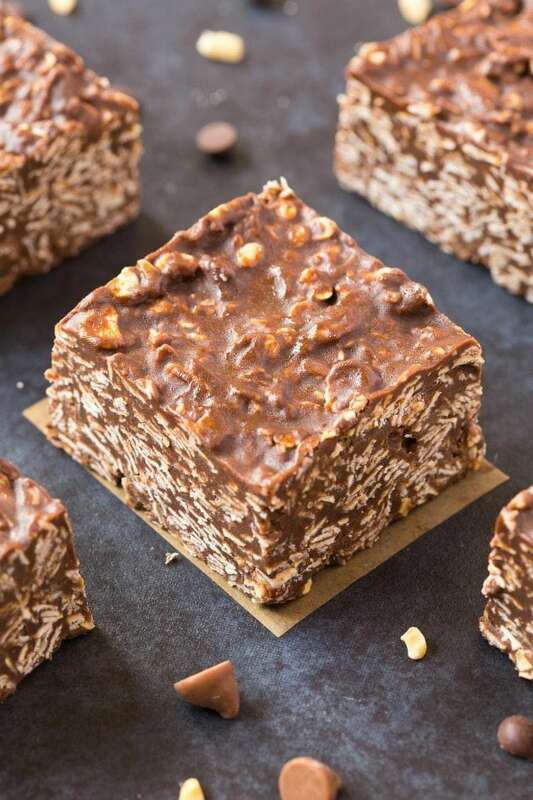 I think what makes this the ideal no bake bar is that the chocolate to oatmeal (or quinoa) to peanut butter ratio is so on point, it could be a snack, a dessert, a healthy treat or something to bring to an office potluck or brunch! Five easy ingredients and five minutes preparation is all you’ll need to whip these delicious bars up and it’s completely fool-proof! They are also suitable for those following a vegan, gluten free, dairy free and sugar free lifestyle! You can either use a microwave or the classic stovetop method and heat your ingredients up, pour over your rolled oats, transfer to a baking tray and voila- Done! Actually, the hard part is waiting for it to firm up, but that is what a freezer is for! Chewy, super chewy or slightly chewy, this can be customized specifically for you! I prefer thinks to be more on the chewy side, so I used thick cut rolled oats. If you want them to be super chewy, use quick oats or even oat bran– The latter will be a little more course, but will still work. If you want the perfect mix, use half rolled oats and half quick oats. Oats are one food which some have intolerances to, so I did test it with something which has become quite a regular on my gluten free cereal/grain rotation- Quinoa flakes! I find them a little nuttier and dense than oats, but it totally fits as a replacement in these chewy chocolate peanut butter bars! You can find them online or at most grocery stores in the health food aisle. To keep the texture even chewier, using crunchy peanut butter will be the best bet! Smooth is my preferred blend, but use whichever you have on hand. If you have a peanut or nut allergy, sunflower seed butter is the best replacement, as it is most similar in taste and texture to peanut butter. 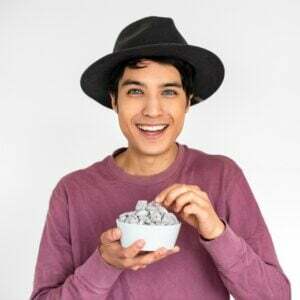 For the chocolate portion of it, use your favorite type, whether that be non-dairy chips, milk, dark or the full throttle- Unsweetened chocolate. The unsweetened one is perfect if you are wanting to keep this completely sugar free, or alternatively, you can use these sugar-free baking chips (I like this brand as it is stevia sweetened). Similarly, you’ll notice this recipe includes a sticky sweetener. I used maple syrup, but it definitely works with agave nectar or golden syrup. Honey works well, but the flavor is overpowering, so ensure you like honey flavored treats if that is all you have. To ensure this remains sugar free, I recommend this sugar free maple syrup, which isn’t filled with artificial sweeteners or additives. Some readers aren’t a fan of using coconut oil and have often asked for a substitute. For this recipe, the only substitute I can really recommend is grass fed or standard butter. 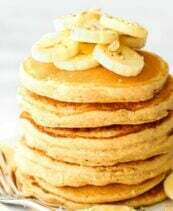 Whether you choose to eat these for breakfast, dessert or an afternoon snack, one thing is certain- They are easy, delicious and will be your new edible addiction! Healthy No Bake Chocolate Peanut Butter Chewy Bars (Vegan, Gluten Free) adapted from the healthy no bake chocolate peanut butter crunch bars. Line an 8 x 8-inch baking dish or deep baking tray of choice with parchment paper and set aside. Add rolled oats or quinoa flakes into a large mixing bowl and set aside. In a microwave safe bowl or stovetop, combine all your other ingredients and heat until melted. Remove from microwave/off stove and whisk until completely incorporated. Pour the chocolate/peanut butter mixture over the oats/flakes and mix until combined. Pour into the lined baking dish and refrigerate until firm (at least an hour). Remove and cut into bars. 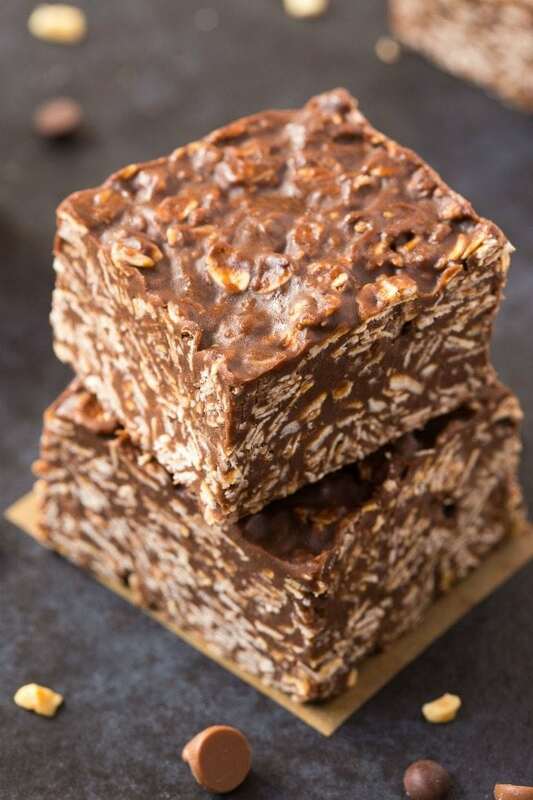 Healthy No Bake Chocolate Peanut Butter Chewy Bars can be kept at room temperature in a sealed container. They are best kept refrigerated for up to 4 weeks. 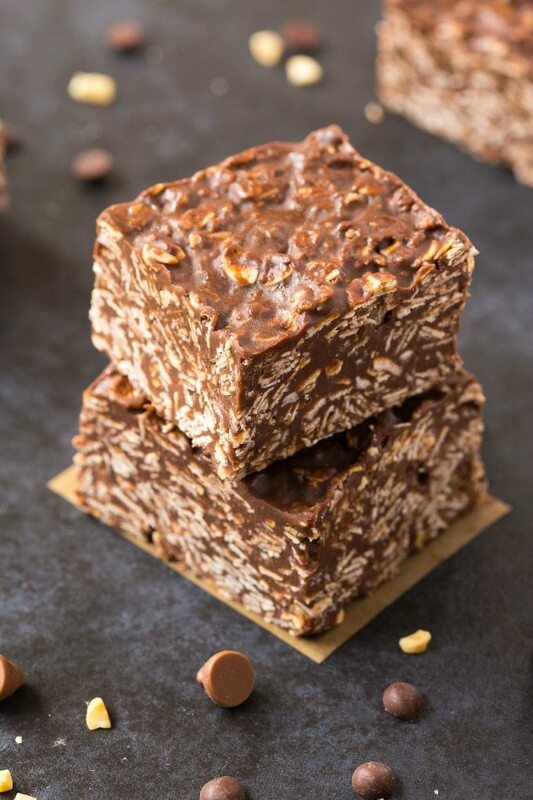 More delicious no bake treats? Gotcha covered! I vote for chewy all the way! I also love the combo of PB and honey. I remember making PB and honey sandwiches as a kid. Looking back, I realize how unhealthy that was as a lunch. I also ate a lot of PB and marshmallow fluff, which is ridiculously amazing. 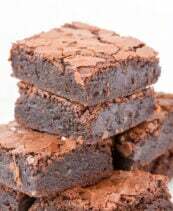 If your photo for this recipe was already published by foodgawker, you shouldn’t submit another photo from the same link to be published again. It is against their TOS and not fair to other bloggers who play by the rules. Hi there, you are incorrect. This is a new recipe submitted. I have never nor have any intentions to submit duplicate photos. Besides, foodgawker don’t allow that. I made these as directed and they disappeared in an instant! 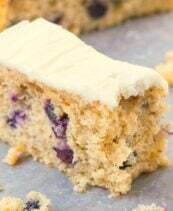 Even my gluten and dairy consuming guests wanted the recipe! I did goof and realized half way through mixing that I was out of syrup so subbed dark brown sugar and it certainly seemed to do no harm. I found the rice cereal to bring a far more interesting texture to the bars than the more traditional rolled oats do. 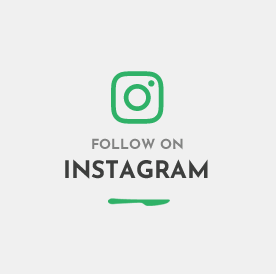 Thank you so much for posting. This recipe goes straight to the head of my carry-in dinner list. Thank you SO much for your positive feedback, Patricia! I made these again. They’re a new household staple. Thank you so much! LOVE IT! You are so welcome!